As they say, no trip to New Zealand is complete without a visit to “The Lord of the Rings” movie location. As an avid fan of “The Lord of the Rings," I visited three movie locations: Mt. Victoria in Wellington, the Hobbiton Movie Set (a bit cheesy) and Edoras. And the most impressive was my journey to Edoras. (Sorry, for the reference to those of you who have not read “The Lord of the Rings” trilogy or seen the movies.) In J.R.R. Tolkien’s fictional Middle-Earth, Edoras is the capital city in the kingdom of Rohan, built atop a rocky outcrop in a valley surrounded by craggy mountains. The countryside of Rohan is a land of pastures and lush tall grassland that is frequently windswept. Peter Jackson brought this fictional place to life in the film “The Lord of the Rings: The Two Towers” which was filmed on location in the Canterbury region of New Zealand. 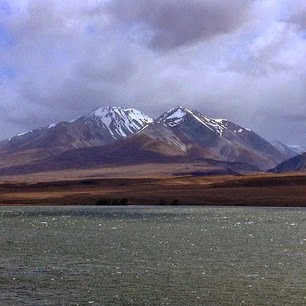 Many scene shots were taken from the Rangitata Valley. The movie set was built on top of the hill called Mount Sunday (Edoras). Today, no traces of the multi-million dollar movie set (buildings) remained because the movie studio made a deal with the New Zealand government to remove the set after filming. But you don’t need the movie set to experience Middle Earth. Getting to Mount Sunday (Edoras) was part of the adventure. We left the stunning view of the blue/green bay of Akaroa and climbed up the very green rolling hills that reached for the blue sky. Sheep dotted the green hills. We descended to a different view of grassland and lakes. I saw black geese prancing around the lake named "Lake" in Maori. Wild birds flew up out of the expanse of grassland beside the lake. Our guide compared the area to Stewart Island where blushing clouds played in the sky. He then talked about the weather in New Zealand that changed in minutes, and the opposing weather between the east coast and west coast, north and south island. He told us to expect high winds near the mountains and warned us about the cold waves coming from the Southern Alps. Our guide described everything we saw and talked non-stop during the 3 1/2 hour-drive from Akaroa to Mt. Sunday. We drove along pastoral landscape. The environmentalist in me was happy to see parcel and parcel of green farmland bounded by well-trimmed hedges and well-designed irrigation system. I had not seen large-scale farms designed like a landscape before. We passed the Rakaia River also known as the Salmon River and admired the bluish water in between the dry land and swirling sand that formed different patterns. We stopped for lunch at the Veteran’s Hall in Somers, a small town surrounded by the snow-laced Mount Somers and two other mountains. We then continued on the road walled by vividly yellow broom flowers, and farmlands enclosed in hedges. At a distance, the snow laced and cloud-covered mountains provided another layer to a very picturesque setting. The mountains and the hanging clouds never left our sight. Past farming towns, the blue sky gave way to alternating white and gray clouds. Then our guide warned us to brace for a severe weather condition. Our vehicle bounced along dirt and gravel roads as we drove through a vast golden valley with patches of yellow broom' spring flowers and sedge grass and grazing sheep. The scenery turned more picturesque as the vast valley rolled into the foot of the snow-laced mountains (Mt. Somers, Mt. Potts and Mt. Sunday). The looming mountains and the blue lakes complete the stunning natural landscape. The weather did not turn out as bad as I expected. Our guide pulled to stop by the lake so we could admire the snow-laced Mount Potts where some of the Lord of the Rings scenes shots was taken. As we got out of the vehicle, fierce winds slammed at us that it was very hard to get photos or a steady video footage of the stunning landscape. Light rain started to fall as we left the Mount Potts overlook. The land got wilder as we drove through the Canterbury Plains. The vast valley seemed impenetrable. Then the wind picked-up; I could see sand dust from the mountain edge blown by the blustery winds. In between giving us some facts about the land and the road condition, our guide entertained us with stories about mishaps and heroic tales during “The Lord of the Rings” filming. Everyone in New Zealand seemed to have taken a part in the film or knew somebody that took part as a movie extra. Landowners across the country rent or allowed the use of their properties during filming – including the owners of Mount Potts and Erewhon stations. Our guide told us about a local person who flew his helicopter in the no fly zone during filming and got in trouble for selling the story to a magazine. Filming stopped when the horses used by the movie studio vaulted due to heavy thunder and lightning. The local who was fined for selling the story, saved the production company by allowing them to use his horses corralled in the area. The light rain stopped as we arrived at Mt. Sunday (Edoras), but the menacing clouds remained. Our guide pulled out some pictures of scenes from the movie to jog our memories. He also brought a Rohan flag and some weapons for us to play with, so we could pretend to be part of the film. While the rest of the group played with the pretend weapons, and held the Rohan flag for a photo-op in front of the hill where the movie set (Meduseld and the thatched huts of the Rohirrim) used to be, I went the other way to admire the river tract from the mountain. "That scenery was not used in the movie,” I heard our guide from behind. He was wondering why I was not with the rest of the group taking pictures of the hill that was used in the movie. For me, J.R.R. Tolkien's book came to life as the valley spread out around me and the craggy hills and mountains opened up before me. I pulled out my SLR camera to capture the surrounding views, but the relentless winds made it difficult to take steady video footage. I decided to use my iPhone instead and I took photos for as long as I was able and stepped back when the wind began to swirl. The wind helped me to imagine the sound of thundering hooves of Rohan's horse people though. At that moment, I was no longer a tourist; I became a part of something else. I was Eowyn, looking out over the valley, the wind whipping through my hair. I was at Edoras, the chief city of the kingdom of Rohan, a part of Middle Earth. I created a video to share my experience. Click HERE to watch it on You Tube or click the thumbnail below.